Warning: the APIs used in this demo are subject to improvement in the future. This is just a demo to get your feet wet with the 0.2.0.1 release of IronJS. IronJS is still in the early stages, so your mileage may vary. How would you like to have a CoffeeScript compiler, running 100% managed code? Well, I’ll leave out the foreplay and get right to it. Fire up an instance of Visual Studio, with NuGet installed. This is pretty self-explanatory, but just in case you don’t have NuGet installed, you can follow the directions on the NuGet website to get started. 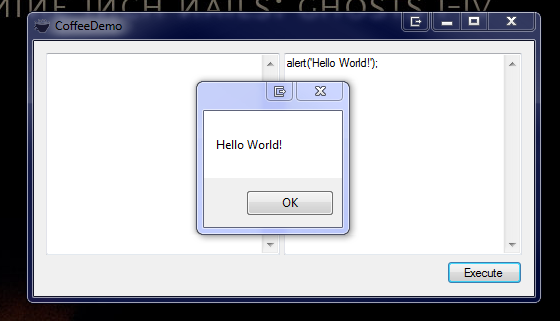 Create a new Windows Application. 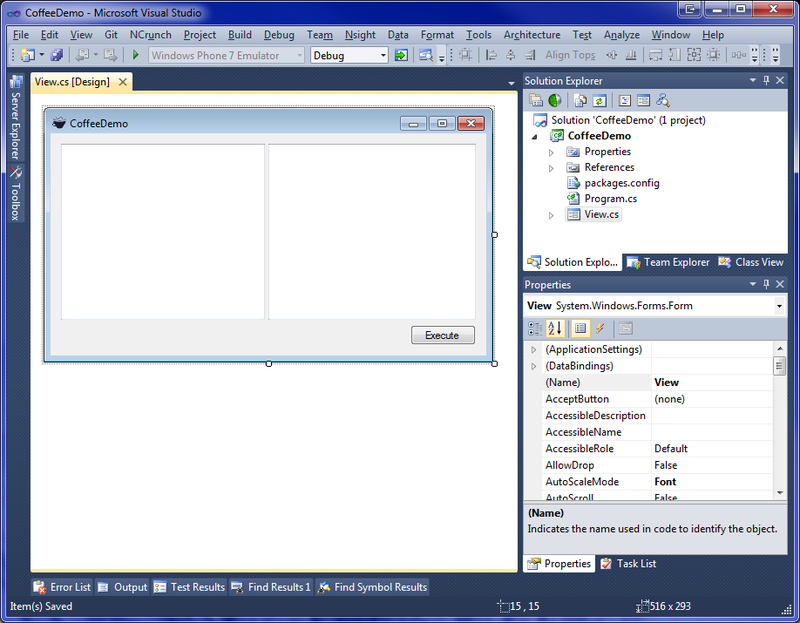 Create a new Windows Application and name it 'CoffeeDemo'. Use NuGet to install IronJS. Lay-out your project and form. 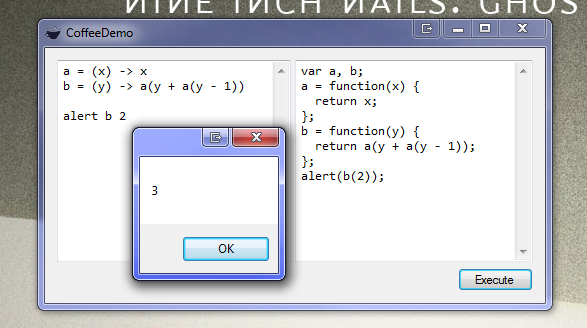 An input textbox, for CoffeeScript. I decided to use a split panel (anchored to all four sides) to contain my text boxes. I set my text boxes to dock-fill and gave them both horizontal and vertical scroll bars. I also anchored my Execute button to the bottom right. Finally, I hate the name Form1 , so I always rename my form to View or MainView. There are a couple of different methods that we could use to bring CoffeeScript into our app. We could include it in the folder, we could add it as an assembly resource, etc. My preference for this demo, however, is to download CoffeeScript to the /bin directory on the first run of the app. Wire-up the TextChanged event for live updating. You should now have a working, live-updating CoffeeScript compiler. You will almost certainly notice the compilation lag on the first key-press where we are compiling the helper function, and calling the CoffeeScript compiler for the first time. The lag is due to IronJS pushing everything into an in-memory, dynamic assembly. Subsequent key-presses should be pretty quick, tho, and we are striving to make it faster. We are actively working on better .NET integration so that you can use native .NET types, all without using wrapper functions. So, stay with us, and please follow us on Github!